It’s April. It feels like yesterday itself I was in a New year party & April is already here. Time really runs fast! If you are a Blogger then you definitely know about the importance of April. April is the month where people from all over the world participate in AtoZChallenge. It’s been almost 2 years (by June) to my blogging journey. Last year I wasn’t aware of this campaign hence this is my first time with AtoZChallenge & I’m really really excited. A2Z challenge is where you have to post from April 1st till the end of the month in alphabetical order. To be more specific, on April 1st you will write a Blog post with title starting with ‘A’, on April 2nd title starting with ‘B’ and so on until the last post starting with ‘Z’. Throughout April you need to post every day (Except Sundays) hence 26 letters will be accommodated for 26 days. You can come up with a theme or write some random posts. The beauty of this campaign is, it is suitable for all niches. It started in 2010 and this year it is celebrating its 10th anniversary. Blogchatter® is a Blogging community, especially for Indian Bloggers. They run various campaigns to keep Bloggers engaged and motivated throughout the year. Last year I participated in their #Myfriendalexa campaign and the bonding has continued even after that. 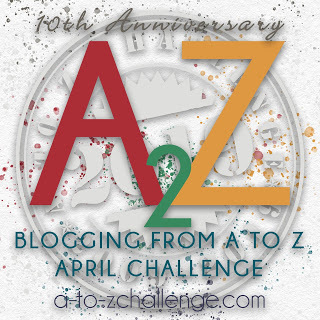 While the AtoZChallenge is happening globally, BlogChatter runs their A2Z challenge and they have a seperate registration form. You can visit their website or Twitter account to register your name & Blog. You can post your A2Z series posts in both campaigns. This way you will get a good exposure on both sides. Blogchatter gives prizes so you need to put some efforts in order to win :D.
How to Participate in AtoZChallenge? All you need to do is go to this Website and register. An entry form will be provided asking your details by filling which confirms your entry. There will be a spreadsheet to maintain your stats during the campaign. Since this is my first time, I’m not sure how exactly this works. So I’m curious about it. This year Badges are simply excellent and I’m going gaga over them. Every campaign or Blog series or Blog Tour will definitely have benefits. Likewise, AtoZchallnge also has a number of benefits and it is worth participating. You will update your Blog constantly. Global & Local Alexa Ranking will be improved. You will meet many wonderful and inspiring Bloggers & Blogs. Your Website stats (Traffic, Bounce rate, Sessions etc) will be improved. You will learn from each and every post. You will get motivated by seeing people appreciating your work. Great Platform to make new friends. What else you want? AtoZChallenge is really worthy and gives promising results. Initially, I thought of writing random posts. I even wrote 26 topics for 26 letters and drafted 2-3 posts. Then my blogger friends suggested choosing a theme. Because having a theme keeps you in the reader’s mind and they can easily recall your name/content next time they visit your Blog. That seems legit to me. Hence I dropped my idea of writing posts on random topics and choose the theme. This year my theme for A2Zchallenge is “Entertainment”. I watch Netflix shows, Amazon Prime shows, HBO, Youtube, and many other series. From many days I was thinking to write blog posts on what I have watched but it never came to action. AtoZChallenge is the best way to write those posts and I can mark my checklist. I will be posting my A2Z posts with hashtag #Favoriteshow throughout the challenge. How to Prepare for AtoZchallenge? Preparation is very important. As a Blogger, I know that it is not easy to come up with a post every day. People think they can write posts on a daily basis but most of the times fail to do so. Hence start drafting posts from today itself. I have aimed to write posts for at least first 13 letters so that I can do the remaining in April. Plan your theme, create images and start drafting. There are beautiful badges with every letter which you can use in your post. Also, display a Badge on your homepage which says you are participating in AtoZChallenge. Badges & the HTML code can be found here. I wish you good luck. Let’s learn together along with having fun. Have you enrolled in AtoZChallenge 2019? This is going to be superb! Wow, that’s an interesting one, I am already addicted to prime and Netflix and your posts will ensure I don’t miss any series. Thanks Pragun 🙂 I will do my best to serve the purpose. This is an appropriate theme for the Netflix-addicted world of today. All the best! I look forward to reading your posts on Netflix series.